// // // // ]]> Since 2003, the United States has spent $818 billion to fund the war in Iraq -- and counting. 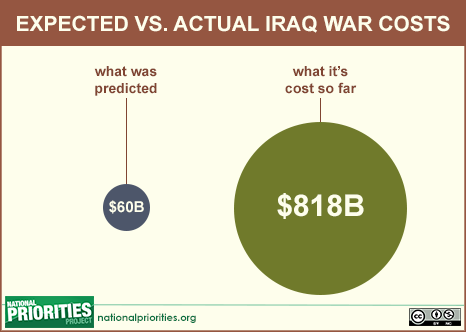 The initial fight in Iraq was meant to cost no more than $60 billion, a small fraction of the cost to date. Congress allocated $5.1 billion in 2015 for U.S. Operations against the Islamic State in Iraq and Syria (ISIS). This counter represtents costs incurred since June 2014. President Obama has requested $5.3 billion for fighting ISIS in fiscal year 2016. In Febrary of 2015, Obama belatedly asked Congress for explicit approval of the U.S. war on the Islamic State - in other words, he requested an Authorization of Military Force (AUMF). As of June, the authorization is still being debated. How much of the US budget goes to the Pentagon?